Original Antique Map Circa 1850s - Surrey. Given the fact this map is over 160 years old, there are Signs of age marks yellowing and potential marks / spots / stains / foxing. TYPE: Antique map with original outline colour. This is an original antique map, not a reproduction or modern copy. Cruchley's Travelling County Atlas of England & Wales with all the Railways & Stations. They were bought by Cruchley, a globe maker and map publisher in the mid 1840s. He then added details of railways, stations and other information. The map was originally produced by Pigot & Co in 1840 for the book 'British Atlas, Counties of England'. This was described as one of the most detailed country atlases of the period. SURREY, 1883 - Original Antique County Map, Bacon. G.W. Bacon. Original Antique Map. No images and/or text printed on the reverse. We include a photograph of the Atlas the map has been sourced from within the photo sectio n as evidence of its provenance. A MAP OF SURREY by Henry Teesdale. Published: By Teesdale & Co 302 Holborn. Henry Teesdale who flourished between 1828-1843 acquired Robert Rowe's English Atlas and reissued it as his own with alterations as the New English Atlas. Original Antique Map published by Henry Teesdale in 1831 in his Atlas titled. Original outline and full wash hand colour. There is also a reference to the Hundreds, a scale of miles & Compass Rose. Publication Date: 1895. 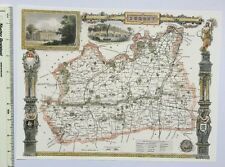 This antique map is one of a series produced for CONDITION VERY GOOD . Overall excellent condition. This example with vibrant original outline hand colouring. Overall size 263mm x 310mm and ready for mounting and framing. 'Map of the County of SURREY by C & I Greenwood'. 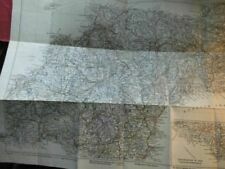 A very large Original Antique Map titled. Overall size of this map is 82cm x 64cm with large margins, perfect for mounting and framing. Central Fold as issued. Map that is showing is 9" x 7" it may be bigger than that ,as the mount is covering part of it. 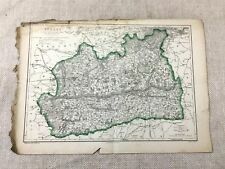 SURREY - Original Antique County Map - LETTS - 1884, cloth mounted. Letts Son & Co Ltd, London. PRINTED IN : 1884. before their reform in 1885. Original Antique Map. sheet map, mounted on cloth backing. COUNTY ATLAS. representation for the growing industrial /. Lett's are, in our opinion,the b est County. 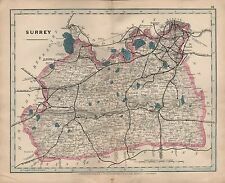 SURREY, 1883 - Original Antique County Map - BACON. G.W. Bacon. from an early edition of Bacon's, in. Original Antique Map. text printed on the reverse. A large Original Antique map. Large map with centre fold. Usual guide remains to back, else clear. Sheet No.30 SURREY (Cloth & Dissected). Undated but pu blished between 1889 and 1911. Provenance:New Large Scale Atlas of The British Isles, Ed and Published by G W Bacon, London 1884. 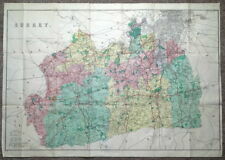 Large lithographed map, bright colours. Suitable for mounting/matting. Single sided, ie there is nothing on the reverse side. Provenance:New Large Scale Atlas of The British Isles, Ed and Published by G W Bacon, London 1892. With tables of population based on the census of 1891. Genuine antique map, not a modern reproduction. DATE PRINTED : c.1835. 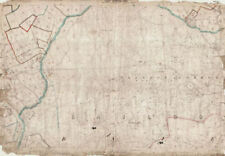 PROVENANCE: Published as a folding map‏ on paper mounted on linen. Original colour on the map backed onto linen, folds into original green cloth covers. CONDITION : Good; suitable for framing. Large antique map of Surrey from Bacons Geographical dated 1891. 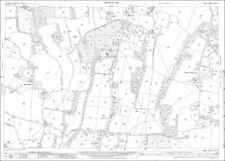 RARE COUNTY MAP OF SURREY c1803. by John Aikin M. D. London c1803. from England Described: Being a concise Delineation of every county in England and Wales. Now a scarce map. Good overall condition with outline hand colouring. Blank on verso. Taken from "WALLIS'S NEW BRITISH ATLAS" & published in 1812. 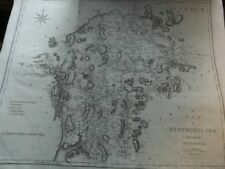 An original Antique Map titled. A fine example of this map by S.A.ODDY. "MAP OF SURREY". An original antique map titled. Overall size 30cm x 23cm with good margins & perfect for mounting and framing. Excellent condition. Get images that. make Supersized seem small. A fine example of this map by Fullerton, hand coloured. 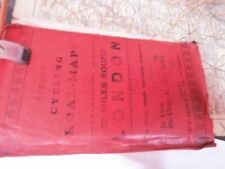 Published by Archer & Fullerton & Co. An original Antique Map titled. Overall size of map is 28cm x 21cm with large margins, perfect for mounting & framing. NEW ORDNANCE ATLAS OF THE BRITISH ISLES. GEORGE W. BACON 1st Edition 1883. AN ORIGINAL ANTIQUE MAP OVER 135 YEARS OLD. To find the approximate size of this map.